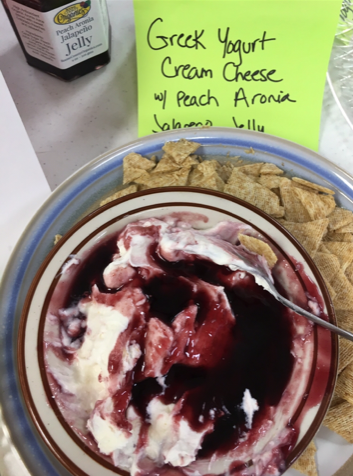 This can be used under a spicy jelly like Boone County Organic’s Aronia Peach Habanero or Clear Creek Orchard’s Mango Habanero, Raspberry jalapeno or any of their spicy flavors. This is also great as the base for a layered dip with salsa, beans & cheese. 1.5 to 2 times as much yogurt as the amount of cream cheese required for the recipe. Chill and use in most of your recipes requiring cream cheese. This can be used under a spicy jelly like Boone County Organic’s Aronia Peach Habanero or Clear Creek Orchard’s Mango Habanero, Raspberry jalapeno or any of their spicy flavors. This is also great as the base for a layered dip with salsa, beans & cheese. Next PostIFC Pick-up is This Week! Note T-Giving Week Schedule Changes!